The unexpected summery weather (which shouldn’t have been unexpected given it was July) meant I had a bit of a craving for light, zingy flavours. That normally ends up meaning I actually want to eat a simple fish and citrus style recipe. This time was no different, and I noticed Cod with Garlic Butter and Gremolata in the June 2013 issue of the wonderful Delicious Magazine. It’s a very straightforward dish, although was constructed in a slightly unexpected way – turns out that despite me thinking I knew what a gremolata was, in actual fact I didn’t. It’s a sort of raw ‘flavour bomb’ type situation. Read the recipe and you’ll see what I’m getting at. 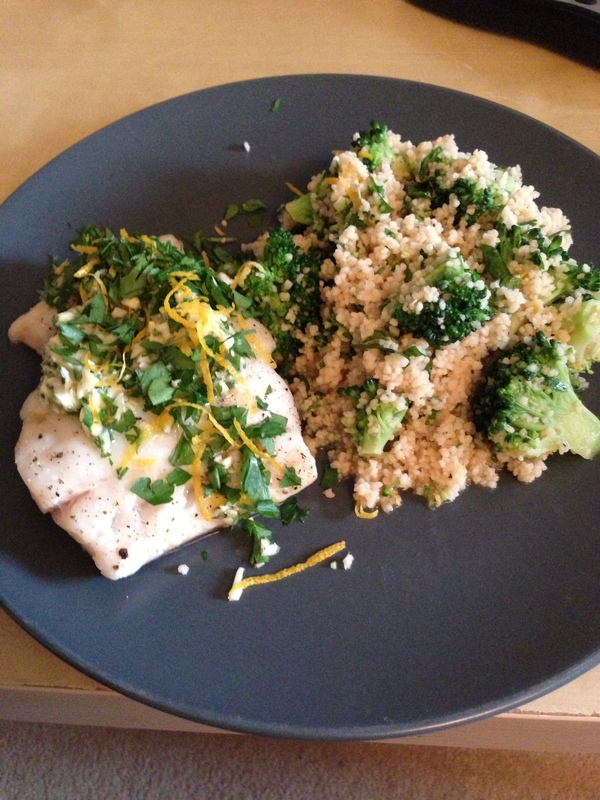 I served this, as suggested by the magazine, with a Citrus and Broccoli Couscous. You can get the lowdown and recipe for this in a separate post here. I found, despite ratio-ing this recipe for two people rather than the quoted six, there was still a lot of the flavoured butter left over. You can freeze this for future use and it’s a nice thing to bung on some fish for a quick tea! Preheat the oven to 180C/fan 160/Gas 4 and line a baking tray with baking paper. Put the butter in a food processor with half of the garlic and a quarter of the parsley, then whizz to combine. Or, as I ended up doing anyway, mash with a fork in a bowl. Set aside. Put the cod fillets onto the lined baking tray, then season and drizzle with the oil. Bake for 10 minutes or until just cooked. Meanwhile make the gremolata. Combine the remaining parsley and garlic with the orange and lemon zest, then set aside. Serve the fish topped with a knob of the garlic butter and a sprinkle of the gremolata. Serve with the Citrus and Broccoli Couscous recipe (link to this above). Categories: Fish, Reidbury Recipes | Tags: cod, Delicious June 2013, summer | Permalink. So with Mother Nature still not making her mind up if it’s actually Spring or Winter my body doesn’t seem to know what type of food it’s after. But having seen this recipe in the the April 2013 edition of Olive Magazine it seemed to tick the right boxes. Add in the fact that Paul is pretty obsessed about anything involving chorizo and chickpeas and I knew I wouldn’t be far from a winner. The dish was really tasty, but I did forget to add the sugar at one point which would really have helped offset the vinegar! Oops. Also, the chickpeas don’t really get time to be cooked, so I’d probably change the recipe around a little to allow the chickpeas time to bathe in the sauce. And prepare to use every pan you own… there has to be an easier way to cook this without using as much cookery paraphernalia as you’d find in an average John Lewis. I’m yet to find it…but I will! Sprinkle the cod lightly with sea salt. Cook the sliced garlic gently in olive oil in a large frying pan. Add the piquillo peppers, then season with salt, pepper, a pinch of paprika and the sugar. Sweat gently for a couple of minutes (the pepper mixture, not you), add the vinegar, and boil until reduced by half. Stir in the chickpeas and remove from the heat. Gently cook the chorizo in a little more olive oil in a separate pan for a few minutes until crisp, then scoop from the pan. Pat dry the cod with kitchen paper then add to the chorizo pan, skin-side down. Add the sprigs of thyme, bruised garlic cloves and a large knob of butter. Keep cooking, basting the fish every so often with the frothy oil and butter. When the fish is almost done, remove two-thirds of the cooking fat, add back the crisp chorizo and olives, then warm through gently. Quickly fry the cherry tomatoes in a pan (yes another one), with a drizzle of olive oil until starting to burst. Add to the chickpeas and heat everything through. 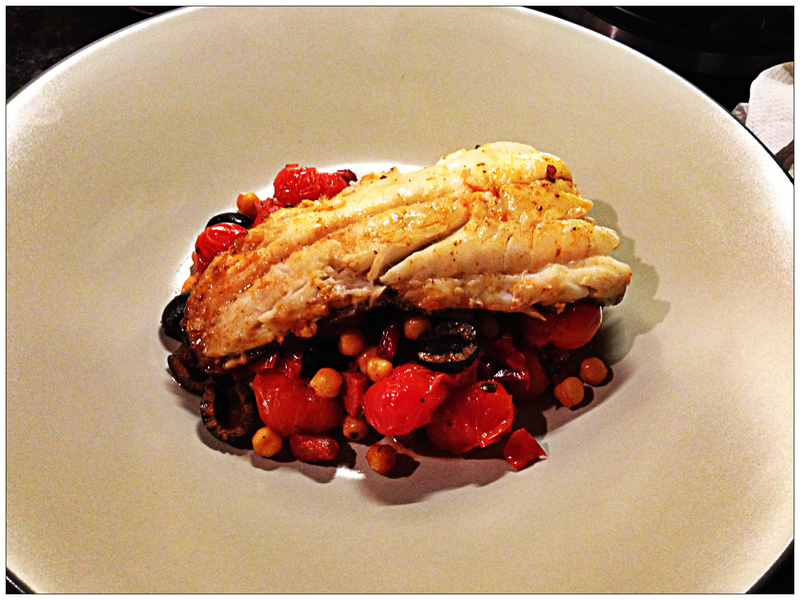 Take the cod from the frying pan and tip the chorizo/olive mix and cod resting juice into the chickpeas. Serve the cod on top of the chickpea stew and serve with toasted sourdough, sprinkled with the sliced spring onions. Get someone else to wash up. Categories: Fish, Pig, Reidbury Recipes | Tags: chorizo, cod, fish, Olive Magazine April 2013 | Permalink.